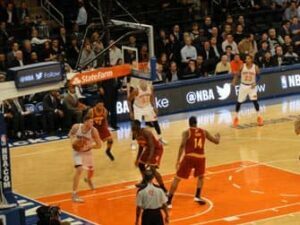 New York Knicks basketball tickets are easy to buy online before you travel to New York. 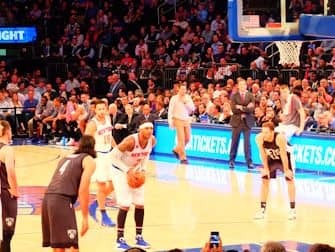 Even if you are not a sports fan, seeing a basketball game in New York is a great experience. Tickets to the Knicks games are very simple to get a hold of. 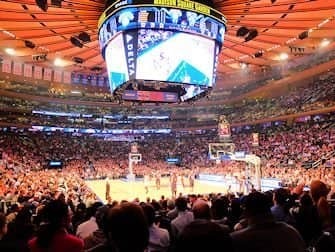 The Knicks play in the famous sports and music arena Madison Square Garden in the heart of Manhattan. The atmosphere in the stadium is always great to experience. Because Madison Square Garden is indoors and warm, going to a game is a fun thing to do in the winter. If you are in New York but can’t get tickets to a Knicks game, check whether the Brooklyn Nets are playing. Basketball season in New York runs from October to April. 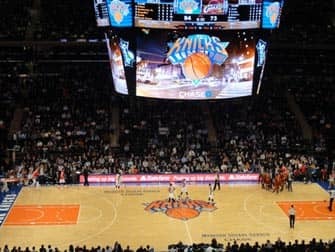 Buy tickets for the New York Knicks by checking the schedule here where you can search all the available dates. The tickets can be paid by credit card and are sent to your address or email. You can also pick up the tickets in New York for free. If you can’t print out your e-tickets, you can also drop by the office. The office is centrally located, near Times Square. Buying e-tickets is the fastest option and the local pick-up is the best option for all other tickets. Both options save shipping costs, so I would highly recommend either option.Your tickets are 100% guaranteed authentic and delivered on time. The tickets on the site are from season ticket holders who cannot make it, which is why they are available at discounted prices. 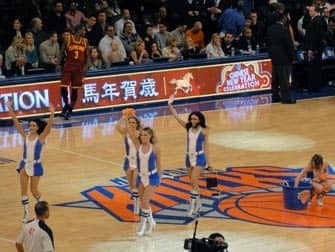 Sometimes the tickets are more expensive than the original price, this means that the New York Knicks game is sold out. Where Should I sit in Madison Square Garden? Good seating is essential for enjoying a basketball game, especially if this is your first time. But you need not buy the most expensive seats. 400- section: These seats are often very cheap but there is a reason for this: you do not see a lot. If you are a basketball fan this might be fun, but if you are going for the first time I would not advise it. 200-section: My favourite! See the sections marked in red below. These seats are great and are good value for money. Cheap Knicks tickets are between $50 and $120. Rows: the lower the number, the better the seating so try and get tickets for row 14 or lower. The photographs are made from section 209, row 9. 100-section: Great, if you are not seated behind a pole. Try and get seats in the middle. Cheap tickets in this section are $200-$250. How do I get to the Madison Square Garden? Madison Square Garden is easy to get to from anywhere in New York. The main entrance is on 8th Avenue between 31st and 32nd Streets, but there are other entrances as well. You can get there by subway A, C, E and 1 and exit at 32nd Street. And if you can walk take B, D, R, N and Q and exit at Herald Square (32nd Street). I would suggest arriving 30 – 60 minutes in advance. After the game you can easily continue your evening anywhere in Manhattan. Taxis will be lined up in front of Madison Square Garden and all subways will still be running.